Nancy McCradie of Santa Barbara's Homes on Wheels reported that Mayor Marty Bloom has joined their Board to actively a first-of-its-kind RV park which will serve hundreds (about half that City's "rubber tramp" population). "The ground-huggers [those without vehicles] are next, " promised McCardie. Pioneered by former Santa Barbara Public Defender head Glen Mowrer has effectively busted the City's sleeping ban and its broader camping ban for those in vehicles using the Necessity defense, ratified at the appellete level in the Ridley-Cooper cases and at the state level in the Eichorn decision . Offering twelve-hours in a church with a forced sermon just simply isn't good enough pretext to roust those whose only affordable housing is their vehicle. Coming up next is to challenge local anti-homeless "thou shalt not sleep" by arguing state law takes precedence. And the state "anti-lodging" law 647j is under attack in Sacramento and Berkeley. 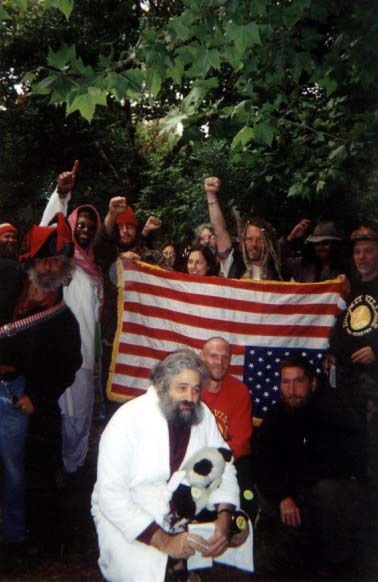 In Sacramento, SHOC (Sacramento Homeless Organizing Committee) firebrand Clifford Crooks called for a Sleep-In at the Sacramento State House with homeless families. "The Sleeping Ban is a Hate Crime" shouted "Protest" Bob Hansen. "In an election year, Davis will not risk the shame of enforcing this law if he is effectively challenged," said Crooks.,Berkeley, B.O.S.S. (Better Opportunities Through Self-Sufficiency) activist Michael Diehl is organizing protests and a prospective Rainbow encampment in the wake of last year's City Council victory. There, when more than a hundred supporters showed up at two successive meetings, the Council required City police to have one complaint and give two warnings before moving on those sleeping outside. Dignity at the Right to Sleep summit J.C. Orton of Knight on the Streets Catholic Worker in Berkeley reported on the struggle to serve free food to the homeless and hungry in Oakland. There, turncoat "progressives" Oakland Mayor "Brown-Out" Jerry Brown and Council woman Nancy Nadel allowed the West Oakland Neighborhood Association to drive away Jim and Joyce Parkhurst's 2 1/2 year old Peralta Catholic Worker daily 7:30 a.m. food-serving operation. East Bay Food Not Bombs is moving in to take up the slack, according to Street Spirit, a monthly homeless paper. FNB has been serving "illegally" in San Francisco and Santa Cruz for the last decade or longer and kept the meals coming because of its willingness to go to jail if necessary in the face of city refusal to grant permits. North of Santa Barbara in Isla Vista, the newest "Camp Paradise"-style encampment--Camp Home Sweet Home (aka Teepee Village) stands strong against new threats of "hide out or get out" . Formed after bureaucrats ignored homeless deaths, it has uncovered a law enforcement scandal--where police have been ticketing homeless for years using a non-existent law. When the Parks and Rec District hastily convened to cover the gap with a new law, Guitar Dave, Jenny Jett and others mobilized massive community support, the District nearly passed a law that would have explicitly allowed sleeping in a park. That proposal was narrowly defeated 3-2; the new law prescribes warnings rather than tickets and mandates a 12-hour stay-away. In San Francisco, the Coalition on Homelessness is giving workshops on how to fight 647j, taking police to small claims court, and mobilizing against an election-year "trash the homeless" plan to gut General Assistance floated by Supervisors "Gruesome" Gavin Newsom. San Jose Food Not Bombs has turned back another gentrification assault on St. James Park and continues to serve food there every Saturday. A dozen residents of Portland, Oregon's Dignity Village [DV] have come down to powwow with its "sister city" encampment Camp Paradise in hopes of forming stronger bonds and helping others to join hands and circle tents. 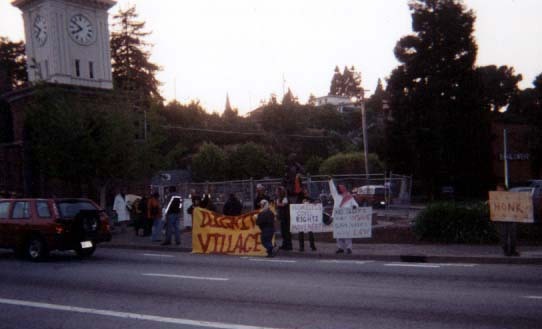 DV, now a year and a half old, got "legalized" after "illegally" refusing to disperse, but is still struggling to get back into a more accessible location. Courts there ruled the entire City Camping Ban unconstitutional, but, reports Street Roots reporter traveling with DV, the City's anti-homeless are coming up with a series of twenty-first century anti-loitering laws--Title 14. Seattle's Tent City III, the oldest of all the self-run clean-and-sober encampments, has six representatives. They recently beat back a City attempt to stop churches from hosting their tents with massive fines. Meanwhile in Santa Cruz, Camp Paradise is still waiting to hear back from Parks and Recreation Czar Jim Lang on a proposal for a two-week conservation-and-camping project in the San Lorenzo Benchlands. 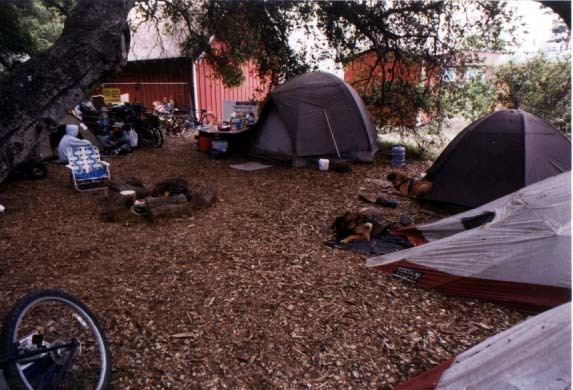 Instead of decriminalizing sleep for Santa Cruz's 1000-2000 homeless or carrying through on a commitment to find an alternate legal site for Camp Paradise, City Council passed a face-saving unusable proposal. It would allow 15 people to do a 2-week project if they jump nine separate insurance and security requirements--hurdles not required by state campgrounds. at the town clock, Santa Cruz, CA Paradise's Templeton is still struggling with charges stemming in part from his unreconstructed authoritarian style with dissident camp members. He and two others are still appealing their "camping" convictions from a police spoiling operation of August 3 when "Homeless Service Officer" Seiley spread tickets and fear through Camp Paradise, though there was no legal shelter anywhere else. Commissioner Irwin Joseph rubberstamped the police department's harassment policy by striking down the "necessity" defense. Irwin claimed the homeless had alternatives but failed to mention any. 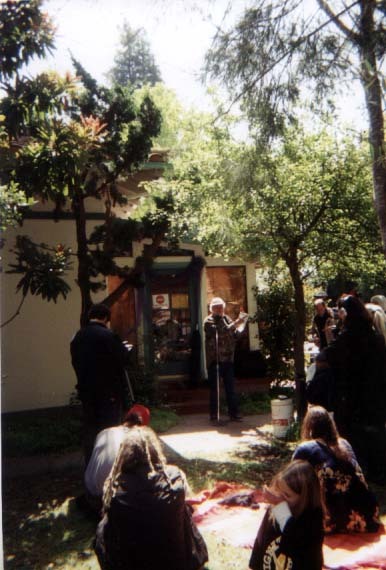 Santa Cruz HUFF [Homeless United for Friendship & Freedom] organizer, Bernard Klitzner hoped to see a revitalized summer campaign against the Sleeping Ban in Santa Cruz emerge from the conference--a movement that would spark action in other cities. Thomas Leavitt announced his intention to return to the Green Party to demand a process for holding Green Party-endorsed Councilmembers like Fitzmaurice and Porter accountable for betraying their commitments. And locally,1000-2000 homeless faced another night of shelter space for less than 40 of their number after the April 15th closing of the Armory roused no response from a City Council more intent on arresting homeless activists than generating solutions. "They can pick us off one by one," commented one Summiteer, "but they'll have a real hard time getting all of us, if we all come to town." Hope and indignation may be the road to dignity and security for homeless communities in three states. For more info contact HUFF at 831-423-4833, HUFF-UCSC at 831-427-0270 or Green Party activist Thomas Leavitt at 831-425-3646. Or go to http://www.huffsantacruz.org .